This month marks 2 years of the journey creating my own brand. While Jessica S. Irvin started as just an Instagram for colorful photos, it has grown into so much more than that. When I started my Instagram account, I knew I wanted to take colorful photos and share them on social but I didn’t have much of a plan outside of that. I think anyone within the lifestyle niche sometimes struggles a little bit to define what exactly they do and who they are. In the past 6-12 months that is exactly where I found myself. I loved what I was doing but didn’t really know how to define who I was and what I was doing. I finally decided to change that. So here I am! I’ve re-evaluated my brand and services, launched a new website, and I hope my mission and purpose is more clear to you than ever! After a bit of a social break, a lot of soul searching, and discussions with Noah (my biggest cheerleader), I feel better about this journey than I ever have! So here we go, meet the new and improved Jessica S. Irvin! So this one hasn’t changed much, I’m the same color loving, Fort Worth living, positive speaking, ice cream eating Jessica that you know and have been so sweet to follow online. I share whatever floats my boat and makes me smile with the goal of it making you feel the same way. Even in the sad and tough times, I’m a believer in finding beauty and positivity in every aspect of life. I don’t just share fun photos on Instagram. I’ve always been the type of person that will take any job thrown at them, then figure out how to do it. While I still like taking risks and learning new things, I’ve finally narrowed down my skill set to four things that I’m both talented in and truly passionate about. Now, this one’s no surprise to any of you, but I’m not just talking about any photography! 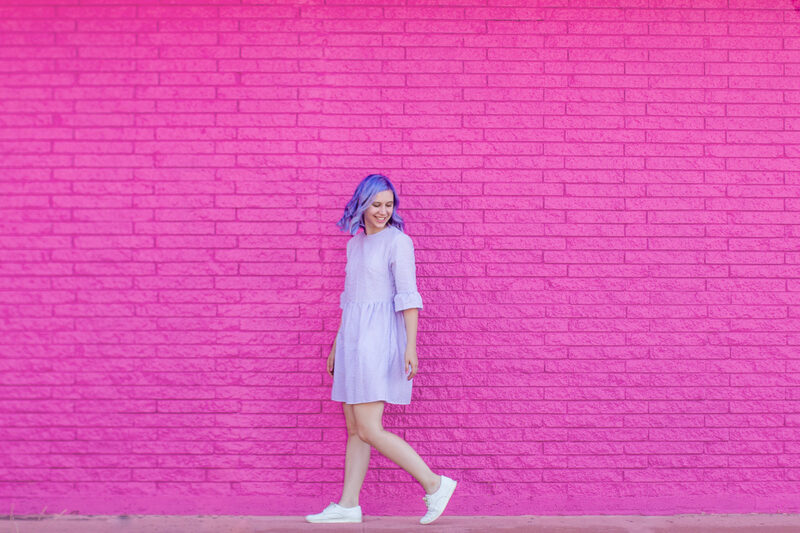 I’m talking about fun and vibrant photography that tells the story of a brand (whether it’s a product or a blogger). I’m done spending my time on photography work that I just don’t love and forces me to hold back creative ideas. People asking for some type of social help is a weekly (sometimes) daily occurrence. I’m always happy to give a helpful tip here or there but I’m also here for more in depth social strategy advice. You might need something as simple as help writing your bios or you might need a full blown social marketing plan. Whatever area it is that you need help in, I’m ready to help! I’ve always loved mentorship and watching people grow and thrive. As a student I never really had someone that was a few years ahead of me in their career to learn from, so I try to be that person to people younger than me. Whether you need advice on your career or how to grow your brand, I’m ready to be your coach and (most importantly) your cheerleader. From sponsored posts to brainstorming ways to make a launch event a memorable one, it’s always a joy to work alongside brands. I can create an experience in my own personal style that resonates with a brand’s audience and helps grow their exposure and following. I think everyone dreams of doing what they love for a living, and I promise you that I don’t take it for granted. It also makes me SO HAPPY anytime someone tells me that my work brightens their day. I couldn’t be more thankful! I’m excited to offer more styled shoots, teach more workshops, and provide more resources for you all! To stay up to date with the latest, be sure to subscribe to my newsletter and follow me on Instagram. Thank you all for your support and encouragement as I have embarked on this journey! You all make me excited to wake up and work every day, which makes me SO THANKFUL. I fell in love with your photos on Unsplash. I do admire how you classified these goals into categories, makes it easier for one to think and reflect on their choices.